Take advantage of MVP’s durable and simple engineering design in the ATG-3500. The ATG-3500 features an infinite number of catalyst percentage settings and low pressure FIT technology. 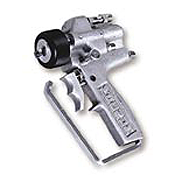 MVP’s patented air trigger design configures as an airless air assist gun or FIT gun. The ATG-3500’s soft spray pattern helps to increase quality and decrease maintenance costs. Both the MVP Solvent-Free APS Gelcoat System and the UltraMAX Solvent-Free FIT Gelcoat System come standard with the ATG-3500 air trigger gelcoat gun, for long lasting operator comfort and reliable material delivery. Proven superior at delivering gelcoat materials at low pressures, the ATG-3500 is the ideal choice when high quality, efficient material delivery are key to the bottom line.